If a medication requires a medical device, patients must learn how to manage their medication as well as how to use the medical device correctly. A lack of proper understanding of how to use the medical device can lead to ineffective drug treatment. Not only must the patient understand how to administer and monitor their response to the medication, they must also be able to understand and follow the step-by-step instructions for the medical device. The patient instructions for the medical device must be simple and easy to understand. They must be written in a logical order of use reinforced by clear photos and a good graphic design that will help increase patient recall. Photoshoot direction. Determination of the photos required for patient comprehension and direction of photoshoots. Incorporation into a graphic design layout that meets patient education requirements. Complete production an option. Our team develops the content of the medical device instructions very closely with the layout at all times. This ensures that the content and design reinforce each other and that photos/illustrations maximally increase patient recall. 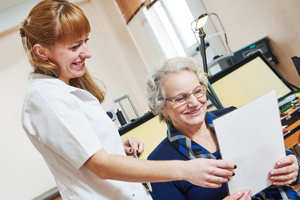 Let us put our over 30 years experience developing patient education programs to work for you! Our team of patient education experts have years of experience counseling patients and have worked with pharma medical, legal, regulatory and marketing teams and FDA for the past 20 years. All of our materials are designed with a focus on patient compliance with the goal that patients will be motivated to manage their medications and medical devices safely and wisely. For a confidential consultation to discuss how to ensure that patients understand how to use your medical device correctly, give us a call today at (703) 734-0650.